What batteries work with the Shoto HDK? Information about battery selection and connection to the Shoto HDK. We recommend using a 3.7V, 900mAh capacity lithium battery. The firmware on the HDK is tuned for charging and monitoring a battery with this capacity. Smaller or larger batteries can be used but to insure safe charging and accurate "fuel cell" monitoring of the battery's charge level additional testing and JSON file changes may be required. The Shoto Core Module has a battery JST style battery connector. 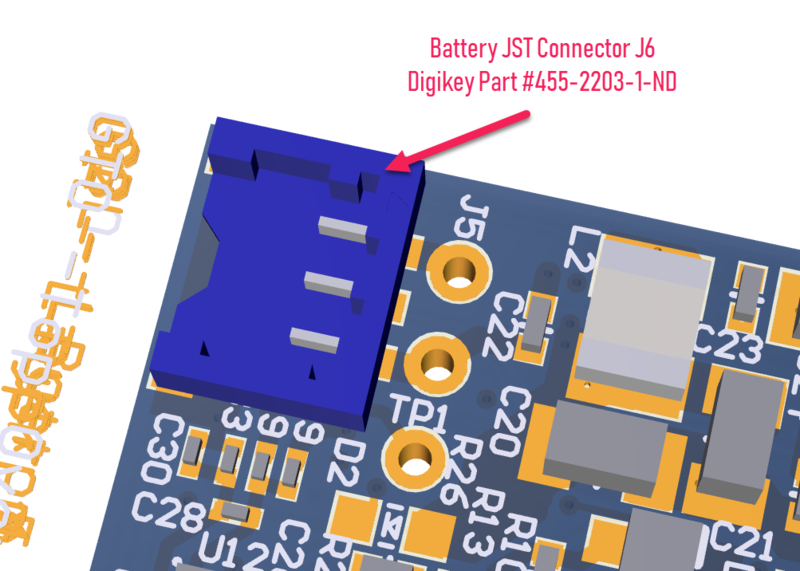 You can connect your battery to the Core Module via this JST connector (see image below). The 3-pin connector the Shoto Core Module is a JST part number BM03B-ACHSS-GAN-TF(LF)(SN) (Digikey PN 455-2203-1-ND). At the bottom of the Digikey webpage for that connector you will see the mating connector options. A mating connector for J6 is Digikey part #455-2198-ND (see picture below). A lot of batteries that come with JST connectors use a two pin style connector. The Shoto HDK uses a 3-pin connector since batteries with a temperature thermistor can be used. If you purchase batteries with 2-pin JST connections you will need to cut off the 2-pin JST connector and replace it with the 3-pin connector (Digikey part# 455-2198-ND). The connections to the 3-pin JST connector are shown below. You do not have to use a battery with a thermistor (see information below). 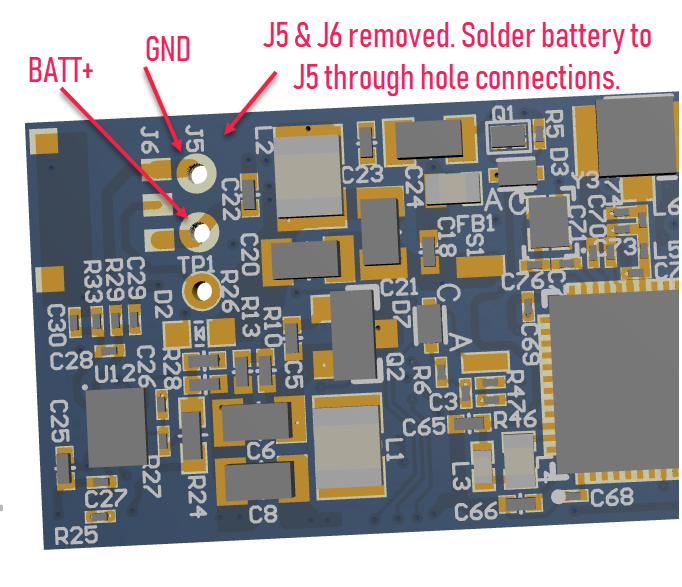 Alternatively, you can de-solder the JST connector (J5 and J6) from the Core Module and then wire the battery directly to the through hole connections at J5 shown below. By default, the Shoto Core Module is setup to bypass the Thermistor reading from the battery. This is accomplished by populating R21 with a 10K Ohm resistor and by not populating R28 and R26. This is the default configuration of the Shoto Core Module as shown in the figure below. To support Thermistor battery pack monitoring: Remove R21 and populate R28 with a 10K Ohm resistor and R26 with a zero Ohm resistor.